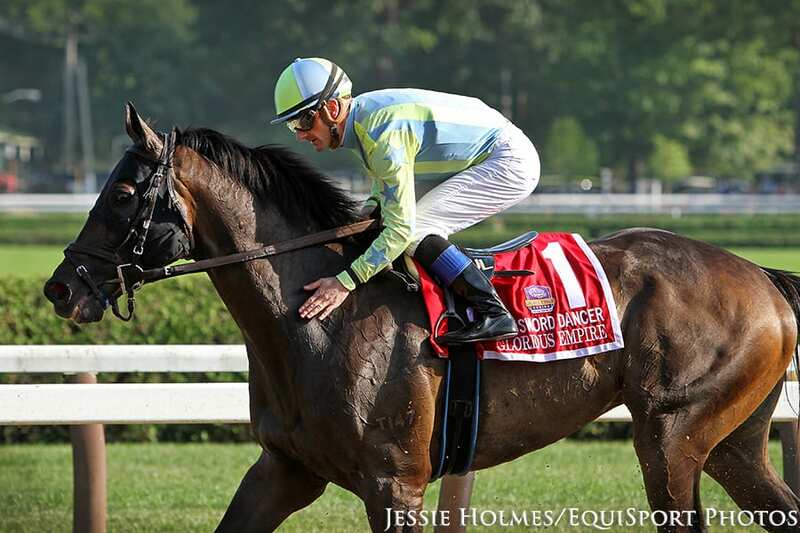 Matthew Schera's Glorious Empire upset the Grade 1 Sword Dancer at odds of 15-1 on Saturday, leading all the way from gate to wire to win by 1 1/4 lengths. The 7-year-old son of Holy Roman Emperor gave trainer Chuck Lawrence his first top-level win, completing 1 1/2 miles over Saratoga's firm turf in 2:24.41. Ridden by Julien Leparoux, Glorious Empire earned an expenses-paid berth to the Breeders' Cup Turf this fall at Churchill Downs. Glorious Empire took the first quarter mile in :23.16, but slowed it down significantly to mark the half in :48.18. From there, he was able to dictate a reasonable pace and pull away from the field in the stretch, winning by 1 1/4 lengths on the wire. Channel Maker finished second and Spring Quality third. The 2-1 favorite Sadler's Joy finished sixth. Bred in Ireland by Patrick Grogan, Glorious Empire was a $151,880 yearling at Tattersalls. He began his career in Europe, winning five of his nine starts, before make the journey to the United States. Glorious Empire has improved with age, and has now won his past three races in a row. Overall, the gelding boasts a record of nine wins from 23 starts for earnings of over $900,000. This entry was posted in Breeders' Cup, NL List and tagged Breeders' Cup, Breeders' Cup Challenge, breeders' cup turf, chuck lawrence, glorious empire, holy roman emperor, julien leparoux, saratoga, Sword Dancer, Tattersalls by Paulick Report Staff. Bookmark the permalink.